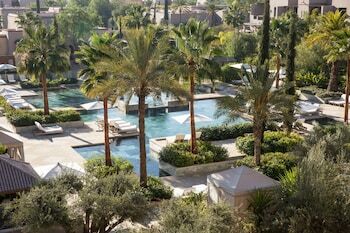 A stay at Four Seasons Resort Marrakech places you in the heart of Marrakech, convenient to Menara Gardens and Jamaa el Fna. This 5-star hotel is within close proximity of Palais des Congres and Menara Mall. Make yourself at home in one of the 139 individually furnished guestrooms, featuring iPod docking stations and LED televisions. Your pillowtop bed comes with down comforters. Rooms have private furnished balconies. Wired and wireless Internet access is complimentary, while DVD players and satellite programming provide entertainment. Private bathrooms with separate bathtubs and showers feature deep soaking bathtubs and rainfall showerheads. Pamper yourself with a visit to the spa, which offers massages, body treatments, and facials. You're sure to appreciate the recreational amenities, which include 2 outdoor swimming pools, 4 spa tubs, and outdoor tennis courts. This hotel also features complimentary wireless Internet access, concierge services, and babysitting/childcare (surcharge). Getting to nearby attractions is a breeze with the area shuttle (surcharge). Grab a bite at one of the hotel's 3 restaurants, or stay in and take advantage of 24-hour room service. Relax with your favorite drink at a bar/lounge or a poolside bar. Buffet breakfasts are available daily from 7 AM to 10:30 AM for a fee. Featured amenities include complimentary wired Internet access, a 24-hour business center, and limo/town car service. Planning an event in Marrakech? This hotel has 10000 square feet (929 square meters) of space consisting of a conference center and a meeting room. A roundtrip airport shuttle is provided for a surcharge (available 24 hours), and free valet parking is available onsite. Four Seasons Resort Marrakech is the perfect Marrakech lodging choice for your trip to Morocco. With numerous amenities for guests such as 24 hour front desk, fitness center, gift shop, you will wake up at Four Seasons Resort Marrakech feeling ready to go every day for your time in Marrakech. Don’t let this amazing reservation opportunity pass you by, book your stay at Four Seasons Resort Marrakech today to make the most of your time in Marrakech, Morocco.